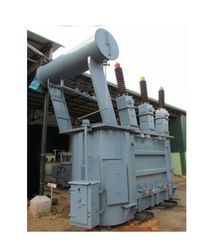 We are engaged in manufacturing and exporting a superior range of Power Transformer. With the support of our highly skilled engineers and technicians, we are able to fabricate a precision engineered range of transformers in compliance with international quality standards. These are designed to sustain high surge inputs and control the current supply. A transformer is a passive electrical device that transfers energy from one AC system to another. It is designed to change voltage from one level to another by means of magnetic induction. The power transformers are capable of accepting energy at one voltage and delivering it at another voltage. Electrical Power Transformers allows electrical energy to be generated at relatively low voltages and transmitted at high voltages and low currents. This minimizes line losses and becomes fit for using at safe voltages. We manufacture power transformers up to 25 MVA capacity with the maximum voltage level of 110 KV for the frequency level according to the standards. 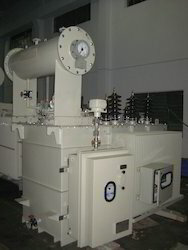 Power Transformer manufactured by us is used to change voltage from one AC system to another by means of magnetic induction. We provide these transformers up to 25 MVA capacities with the maximum voltage level of 110 KV for the frequency level according to the standards. This generates electrical energy at relatively low voltages and transmitted at high voltages and low currents. 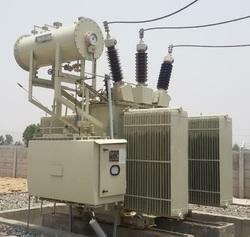 We offer an ample range of Power Distribution Transformers. These require high quality and purity of insulating Oil during the time of use for all present and future transformers, to obtain optimum performance from the transformer. We do not compromise with the quality of these transformers and so we use the high-grade raw material for the manufacturing of these transformers procured from some of the most trusted vendors of the industry.This minimizes line losses and becomes fit for using at safe voltages. We manufacture power transformers up to 25 MVA capacity with the maximum voltage level of 110 KV for the frequency level according to the standards. We manufacture and supply high-quality Dry Type Power Transformer. 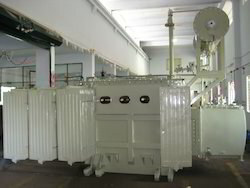 Before final dispatch, these Dry Type Power Transformer are strictly inspected on certain parameters of quality in order to rule out every possibility of defect. Our range of Compact Substation is manufactured using quality material and latest manufacturing technologies. We can manufacture bulk orders of this product in a short span of time. These stations are high in demand as these are flawless and manufactured using high-quality machines and other required raw material, sourced from the prestigious vendors of the industry. We produce high-quality package substations.